The event got started Friday afternoon as the train was put together and the tracks were cleared for the event. Here, 1315 is on the Poplar Creek bridge on the K-Line, moving a string of intermodal flats. Here the crew is switching two former US Army fuel tank cars, recently acquired from the Y-12 nuclear weapons facility, thanks to the help of the US Department of Energy. We generally try to feature a night photo session during these events, and Steve Barry of Railfan & Railroad Magazine was on hand to do just that. 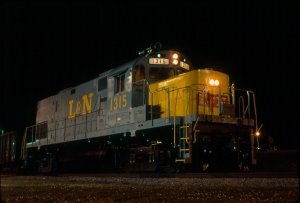 Here is L&N 1315 lit up in all her glory. Looking like a scene from Coal Country, L&N 1315 is lit up parked next to an N&W caboose. On Saturday, we started with screaming sunshine and took advantage of it with almost a dozen runbys by noon. Here is 1315 in the woods near Blair, where several scenes for the movie "October Skies" were filmed. We also used a C-420 on the passenger train, hauling 60 passengers between the photo locations. Here it is seen near the north end of the line at Blair. Here is 1315 doing what she was built to do - haul freight. What is more Appalachian than an L&N C-420 passing a house up a holler? Here we do it on SARM's museum line. 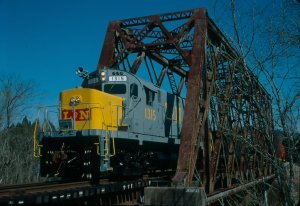 Here is 1315 on the Robinette bridge, a favorite photo location on the line. 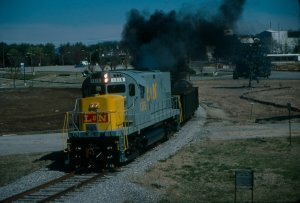 L&N 1315 passes a Southern whistleboard near TVA. The lattice bridge over Poplar Creek is another favorite photo spot on our line. Here 1315 is coming off the south end of the bridge. Nothing like a still morning for some nice reflection photos on Poplar Creek. The last runby of the sunny morning was in front of the former K-25 Manhattan Project facility, making for an interesting industrial photo of 1315. We end this part of the show with a photo of L&N caboose 6487, restored to go with L&N 1315. During lunch, clouds moved in so we charged to a strategy of a posed train. Here, 1315 is posed in Blair Yard, our interchange location with NS. Did you see this shot in Railfan & Railroad Magazine? A hole in the clouds allowed this quick photo on one of several bridges on the line. Here 1315 is posed at Kudzu Hill. We ended the day with a trip over the K-Line past the old K-25 substation.